Taimur Ali Khan was spotted with mother Kareena Kapoor Khan at a birthday event in Mumbai. 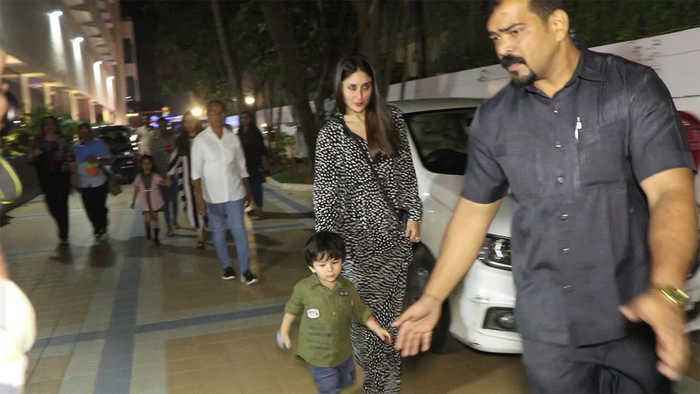 He was sporting a grey shirt with jeans while mother Kareena was wearing a black maxi. Taimur walked with his mother towards the car and posed for the cameras. Other celeb kids also attended the event. Kids of celebs like Sunny Leone, Soha Ali Khan, Karisma Kapoor also attended the event among others. National Award-winning filmmaker Madhur Bhandarkar has dismissed reports that he is making a film on actor Saif Ali Khan and Kareena Kapoor Khan's son Taimur Ali Khan. Taimur is one celebrity kid who..
Punjabi singer-actor Diljit Dosanjh is bowled over by the B-Town couple Saif Ali Khan and Kareena Kapoor Khan. While Saif has got the swag, his wife and actress Kareena will always be special to..
Actor Sushant Singh Rajput, who worked with Sara Alia Khan in ‘Kedarnath’, recently shot some scenes with her father and actor Saif Ali Khan in ‘Dil Bechara’. Asked about his working experience..
#SaifAliKhan loses cool on photographers over constant attention his son #TaimurAliKhan has been receiving. Watch the video. Kareena Kapoor Khan And Saif Ali Khan ADOPT A Baby Boy? Kareena Kapoor Khan and Saif Ali Khan were recently seen shooting for an ad film and were also spotted with a mystery boy. Watch the video to know the entire story behind this mystery boy! Actress Soha Ali Khan, who has been in the industry for almost 15 years and comes from a family full of popular names including Sharmila Tagore, Saif Ali Khan and Kareena Kapoor Khan says showbiz is..
#KareenaKapoorKhan reveals her son Taimur Ali Khan's diet plan. Father Saif Ali Khan also reacts on the same. Check it out.